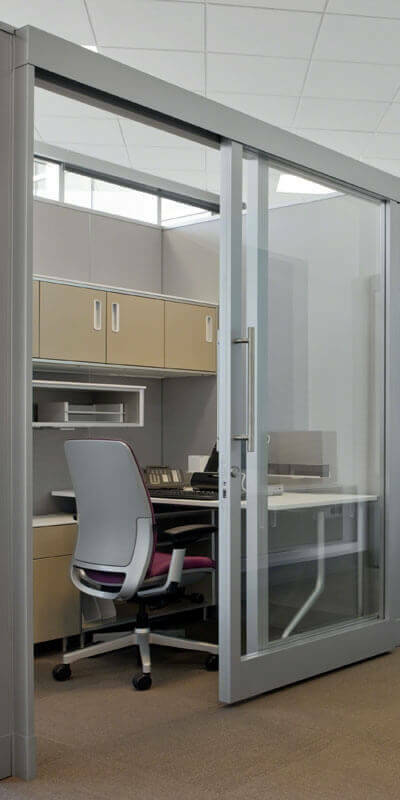 Glass walls and doors make a fantastic addition to modern offices. However, glass partitions and interior enclosures are also ideal for the home. Glass window wall systems add luxury to residential properties. More importantly, glass walls and doors don’t just complement ultra-modern architecture. As well as this, glass partitions and railings can add fantastic aesthetics to even historical buildings. Window walls are fast becoming a design staple in Toronto homes. Thanks to the durability and affordability of specially tempered glass, more architects now use glass walls to showcase properties. Bringing the outside in, exterior glass walls enhance views and improve the health and wellness of homeowners. Prolonged exposure to blue light emitted by LED and fluorescent lights isn’t healthy. Physically and psychologically, people crave natural light. Glass wall windows satisfy this craving by allowing more natural light to enter homes. As a result, properties feel much more open and benefit from significantly reduced power consumption. Glass window walls and interior wall spaces significantly reduce the need powered lighting loads. Lighting accounts for up to 10% of average home energy costs. Glass walls, therefore, foster power savings by allowing more natural light to diffuse further into residential interiors. At the same time, glass is a neutral design element. Glass wall panels subsequently complement both ultra-modern and older historical building architecture. Are Glass Walls and Doors Safe? At a quarter-inch thick, glass walls have equivocal durability to plasterboard and plywood. Glass panels used in interior and exterior walls and doors, are also specially tempered for extra strength and shatter resistance. Thanks to their transparency, glass walls and doors feel psychologically less confining. Even smaller living spaces can, therefore, be equipped with the illusion of extra space. This is especially true when large floor to ceiling walls are used to dispense with the psychological boundary between interior home spaces and outside decks and balconies. When remodeling an office, use of glass partitions cuts energy costs and adds noticeable sophistication. More importantly, by allowing more natural light to enter a workspace, workers and visitors experience less stress, fatigue, and eye strain. Ideal for offices, glass walls are the go-to option for modern, progressive companies like Apple and Google. However, interior and exterior glass walls aren’t just perfect for office spaces. Bars, restaurants, hotels, and retail premises, increasingly incorporate glass into their own building architecture. Doing so creates a modern, airy ambiance, which broadens the appeal of establishments to members of the public. Glass is one of the most versatile of modern construction materials. As a result, glass panels used in building interiors can be fabricated to a range of sizes. Panels can subsequently be used as medium height partitions or full floor to ceiling walls. Glass can also be soundproofed and specially strengthened for use in balconies, property entrances, and full height window walls. 808 Glass trusted by both businesses and homeowners to supply durable glass for a range of architectural purposes. Regularly working with companies and property developers, we create for-purpose glass doors and walls which are unmatched in terms of durability. Every 808 Glass installation, therefore, benefits from a comprehensive warranty supplied by us on all parts and labor. Are You Looking to Renovate or Remodel? If you are planning to add new glass walls or partitions to your property, we can help. Simply reach out to us today and benefit from a free, no-obligation initial consultation.